Election time is not the time to exploit tragedies. Neither is any other time. Tragedies need to be met with fortitude, support and understanding. Pain and suffering have to be addressed head on all the time. As a film maker, I have always tried to address social problems. But that is not enough. That is why I took the plunge and intervened both socially and politically. Economic emancipation, I believe, is the road to freedom from social inequalities and deprivation. I am proud of the large number of young people who have been lending support-shoulder to shoulder- to alleviate pain. My kar sevaks- volunteers- have been selflessly working for the last five years and have stood out with their commitment and sense of social duty on all fronts- whether in hospitals, during floods here in Champaran and more recently in the Kosi region. 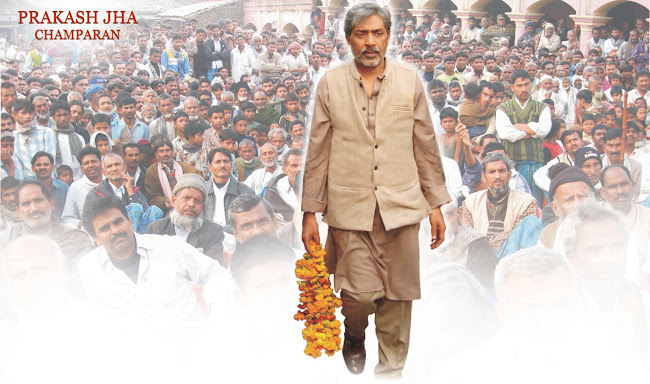 Prakash Jha Sewa Kendra is not about me. It is about Champaran’s sense of duty to itself. Each and every citizen needs to be awakened to this sense of belonging and service. 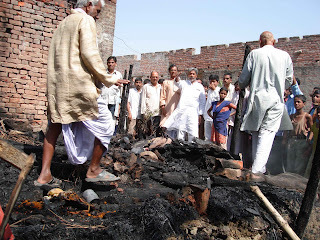 About five dozen villagers suffered third degree burns in a devastating fire in Sukhi-Semra village under Palanwa police station of East Champaran district early Friday morning. My campaigners, who were passing by immediately put brakes to canvassing in the area, rushed to the accident spot and helped reach victims to hospitals. Raxaul’s Duncan hospital could not take in many patients. They were rushed to Motihari and Bettiah. For the last five years, my able volunteers have been doing round the clock duty at Motihari’s Sadar Hospital and at M J K Hospital in Bettiah. So when victims of the Sukhi-Semra fire accident were brought to hospital, my kar sevaks sprung into action within no time. Being alert to one’s social responsibilities helps in mitigating problems whenever they crop up. When I reached the village, the charred debris and rancid smell narrated the tale of devastation. And the agony on faces all around was heart-breaking. Being there with them in their grief, I felt, was simply sharing their tragedy. Life must move on and I’m sure the villagers will find the resilience to rehabilitate themselves. They know that I’ve been in their midst and will not abandon them. If we are sharing sorrow today, we will also rejoice together tomorrow. Through thick and thin, We together shall overcome. I read in local newspapers that supporters of the odd opponent too chipped in with help. An itinerant candidate trying his luck here too landed up. Offering solace and help, both merit appreciation. But should this sensitivity be limited to election time? Champaran is my janma-bhoomi, Mumbai has been my karm-bhoomi. I have made both my name and fortune as a film maker. But I owe to repay my debt to Champaran, my birth place. Am I here looking for stardom and riches? Do I need either? What I need to do, I am doing. I have pledged to strive towards a singular goal : Bringing a smile to Champaran’s face. 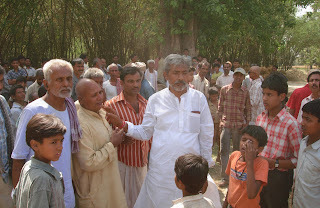 prakash sir best wishes to you from all bihari who think about development of bihar. kya apna bihar banglore or delhi nahi ban payega. hum kab tak naukri ke liye dusro sahro me apno se dur rahenge. यदि आप अंगरेजी में लिखना जरूरी समझते हों तो क्या यह संभव होगा की आप इसे हिंदी में भी प्रकाशित किया करें, मुझे लगता है उस से आप की आवाज ज्यादा लोगों तक पहुँच पायेगी. खास कर बिहार में जहाँ आम आदमी को अंगरेजी में दिक्कतें पेश आती हैं. अभी अभी मैंने एक मुद्दा उठाया है. क्या आप इस बात को आगे ले जा पाएंगे? NETA JI BACH GAYE SAAP CHAL BASA." 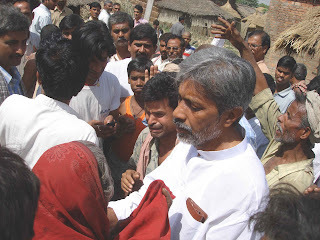 I support to Prakash Jha, but i sorry he is defeated in election but i thanks him for he is first leader who help the victim of fire accident of sukhisemra, my brother abhay kumar jha was also in serious condition and later he was refer to patna along with some other victim but some one was expire, named mr. udho jha, mr. ishwar patel mr. utam kumar jha, they are real hero of sukhisemra, but they left us, god give him peace of his soul. my brother is now safe, if praksh jha not support in bettiah there was dozen of people who expire. but now all are safe and doing there work. Thanks to all who are thinking about development of Bihar. We all should try to overcome the problems that we are facing recently. please visit this website and know about Motihari, Bihar and India. If you have any suggestions then please let us know.